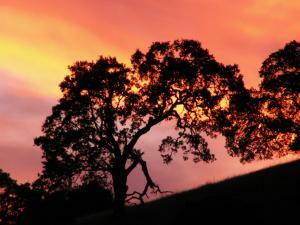 Join us for a relaxing stay at Rancho Cicada! 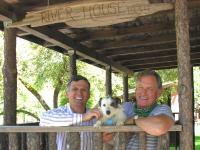 David Roberts started Rancho Cicada in 1980, and has been hosting guests and outdoor events since then. Whether you're planning an outdoor wedding, family reunion, company BBQ, or if you just want to get away for a bit of "luxury camping"
Our extensive lawn is a perfect place to play games, host a party, or simply relax. The Cosumnes River flows through the property and features some great swimming holes, rope swings, and small rapids. 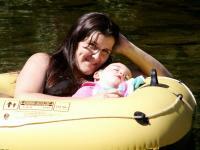 Spend some time at Rancho Cicada in Amador County and go swimming, snorkeling, rafting or innertubing. For those looking to relax a bit more, enjoy our hammocks by the river, or large hot tub with fantastic views. 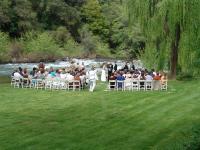 There may not be a more beautiful wedding location in all of Amador County than Rancho Cicada Retreat. Outdoor weddings held here are breathtaking, making for wonderful memories and fantastic photos. While weddings can be very expensive, we have found that by affordably sharing our beautiful retreat with new people we promote future events, as many of our visitors are repeat customers. You'll be pleasantly surprised at how inexpensive your wedding can be! Rancho Cicada offers it all: from tents and small cabins situated along the river to fully self contained larger cabins available year-round, we're sure to have something that everyone can enjoy. Whether you're staying with us for an onsite event, or just making reservations for a nice quiet getaway from the city, our location along the Cosumnes river is a beautiful, relaxing place to experience nature. 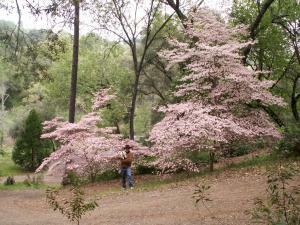 Rancho Cicada is only an hour from Sacramento and two hours from the Bay Area. Rancho Cicada is a relaxing, nature-oriented resort located on 44 acres along the Cosumnes River in Amador County, 50 miles east of Sacramento in the historic Gold Country, nestled in the Sierra Nevada Mountain foothills. Our beautiful river valley radiates healing energies. The native Mi-Wok Indians had a large fall season encampment on the site, which is evident from all the riverside grinding rocks. You won't find a more beautiful and natural setting to hold your event, reunion or outdoor wedding! 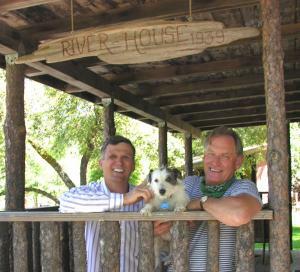 Hosts David and Bill invite you to come and discover nature's magic at Rancho Cicada Retreat.